Norfolk – A popular holiday destination located in East Anglia in the United Kingdom, Norfolk is perhaps most famous for its Norfolk Broads. The county of Norfolk has an area of 2,074 square miles, a population of around 900,000 and has seven districts: Breckland, King’s Lynn and West Norfolk, Broadland, North Norfolk, South Norfolk, Great Yarmouth and Norwich. Norfolk is low-lying and flat and has been settled since Pre-Roman times. Norfolk has some popular seaside resorts among the best known being Great Yarmouth, Cromer, Hunstanton and Sheringham, but is best known for its Broads National Park which is a popular destination for boating holidays, fishing and the observation of wildlife. The Broads National Park covers an area of around 117 square miles with about 120 miles of waterways suitable for navigation, there are sixty three broads and 7 rivers, mostly within the county of Norfolk but some within Suffolk. Norfolk has just one city and that is Norwich which today has a population of over 200,000 people and during the time of the Normans was one of England’s largest settlements. The second largest settlement is King’s Lynn with over 42,000 residents. Majorca the Holiday Island – Every summer, you might think that all of Britain and Europe vacations in the island of Majorca. Since the 1st purpose built tourist resort during the nineteen sixties, the island developed into the primary choice for getaways in the sunshine. Palma Nova was one of the first purpose built resorts and is still popular today. The combo of busy nightlife, numerous accommodation, hot sun, gorgeous white sandy beaches together with low price air tickets have made value holidays in Majorca irresistible for most people, with the island attracting over twenty two million vacationers from Ireland, the UK, France and all over the globe every summer season all searching for sunshine, sand, sea and sangria. There are many more magnificent beach resorts than I can mention at this point but amongst the better resorts are Magaluf, Alcudia, Puerto Andratx and Palma Nova. On the east coast you will find some quieter resorts and if you are not worried about nightlife you might be better advised to head here, perhaps you could try Puerto Pollensa or for a very quiet time maybe Cala Bona, Cala Tropicana or even Cala d’Or. Tenby Wales – A small seaside town with a population of just under 5,000, Tenby is a popular holiday destination, though perhaps not as popular as it once was. The town boasts some two and a half miles of beaches (good sand), and some interesting places to visit. Tenby still has some of its medieval town walls, dating from the 13th century, the main feature being the 5 Arches Barbican Gatehouse, other places to visit include the Tenby Museum & Art Gallery, the National Trust run Tudor Merchants House, St Catherines Island, St Mary’s Church (15th century), and the pretty Tenby Harbour. Walkers and Hikers like to make the most of the fabulous Pembrokeshire Coastal Path. Cabo Roig Apartments for Rent – We still have some availability left on our range of Cabo Roig apartments for this coming summer, so if you are looking for a holiday on the Costa Blanca, Spain, be sure to get your apartment booked soon, as dates are being filled up fast. 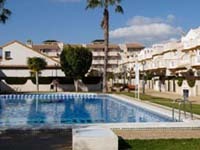 Most of our apartments are close to the seafront of Cabo Roig and also close to local bars and restaurants. All have the use of communal pools and are fully equipped for your vacation. Holidays for next winter time are available from just 125 euro for a weeks stay in a one bed apartment, while this summer’s holidays will set you back a little more. If you are looking to spend your holidays in Playa Flamenca on the Costa Blanca this year, then we could have just the ideal property for your stay in the region. We have a perfectly located two bedroom apartment in the Alameda del Mar complex which is situated beside the N332 coast road facing the sea. The apartment is in the La Calma block of the complex and faces inwards towards the very attractive community pool and garden area. It is situated on the third floor and benefits from its own private solarium, which is quite large and is a great place for sunbathing when the weather is fine, which is normally is in the Playa Flamenca area. The apartment is bright and spacious and both bedrooms have en-suites (one a bathroom and one a shower room). The Flamenca Beach commercial centre with its huge choice of cafes, restaurants, shops and bars is just a two minute stroll from the apartment, don’t forget to pop into the Temple Bar for the famous Blues Brothers show. One of the most popular areas of the southern Costa Blanca, Villamartin is actually on the part of the coast that is known as the Orihuela Costa, which is the coastal region for the city of Orihuela which is about 19 kilometres inland from the sea. Developing around a top class golf course the urbanization of Villamartin has grown and grown over the last 20 years or so and now covers a significant area, joining Villamartin with surrounding urbanizations and towns, such as Los Dolses, Playa Flamenca, La Zenia and San Miguel de Salinas. The property boom in the late 1990’s and early 2000’s saw thousands of UK and International buyers purchasing holiday homes in Villamartin and many even choosing to settle permanently in the area. The financial crisis of the last 3 years has caused many to reconsider their position and many hundreds have subsequently sold or are trying to sell their properties and return to the UK. There is currently a glut of properties available to buy in Villamartin and it is a great time for investors, with many properties being half the price they were at their peak (or even less in some cases). For those wanting to holiday in the area, there is also a wealth of rental properties, and with so many available you can always find cheap villas and apartments to rent in Villamartin and the surrounding urbanizations. What is the attraction of Villamartin, you may well ask, well the excellent golf course would be a big plus for those interested in this sport, the proximity to the beaches and resorts of the Orihuela Costa would be another tick in its favour, the wonderful weather conditions are also a big attraction, along with the excellent facilities and entertainment possibilities, especially at the popular Villamartin Plaza, so there are plenty of reasons to visit Villamartin some time soon . Villamartin is approximately twenty five minutes drive from San Javier airport, and is in the Alicante province of Spain. A large and popular seaside resort located on the north coast of Devon, in the United Kingdom, Ilfracombe first developed around an Iron Age hillfort, established on a nearby hill. Its sheltered position, protecting it from the worst of the region’s stormy weather, led to its becoming an important seaport, and it was used for a number of naval sorties over the centuries. Making its income mostly from fishing for many years Ilfracombe has, since Victorian times become popular as a seaside holiday resort. The Victorian used it for sea bathing after tunnels were dug to several of its shingle beaches. These days it attracts holidaymakers, who enjoy its charming and attractive harbour, good climate and weather, superb coastal walks, boat trips and sea fishing trips. Catch up on the local history of Ilfracombe at the Ilfracombe Museum, where you will find interesting facts about the town’s maritime history, and also see a collection of model ships and steamers, which have sailed the Devon coast through the centuries. An excellent place that you could visit if you are taking a holiday in Newquay, Cornwall, this year, is the beautiful Watergate Bay, located some two miles north of the resort, near to the village of Tregurrian. With a wonderful long sandy beach, and a bay exposed to north-westerly winds, Watergate Bay is a renowned location for surfing and water sports. Such a great spot that the National Surfing Championships have even been held there in the past. Ideal if you ever wanted to learn to surf, Watergate Bay is also fantastic for kite flying, so while you are learning to surf, the kids can be having their own fun. There is plenty of self-catering accommodation in the area, with caravan parks a plenty, there is also an excellent hotel, called the Watergate Hotel, which overlooks the bay. The vibrant nightlife of Newquay is just a short drive away for your evening entertainment.